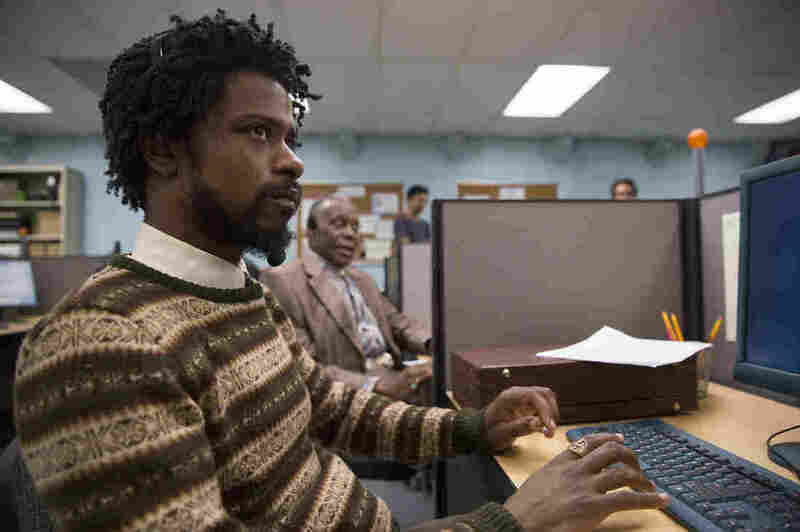 Actor Lakeith Stanfield: 'We All Have Images That We're Attempting To Push' Stanfield has had a number of oddball roles, most recently in the telemarketing satire Sorry to Bother You, where he plays a character who learns to get ahead by using a "white voice" on the phone. Lakeith Stanfield stars as telemarketer Cassius Green in Sorry to Bother You. Actor Lakeith Stanfield is having a moment. He was in Jordan Peele's Oscar-winning horror satire, Get Out. He's in the FX show show Atlanta, where he plays Darius, the stoner sidekick to a rap star who often says pretty outrageous things — like speculating what life would be like if you could use a rat as a cell phone (people in New York City would be doing pretty well, for example). And this summer, Stanfield is in the new movie, Sorry to Bother You, which he calls "an absurdist dark comedy with magical realism that's set in the world of telemarketing. It tells the story of Cassius Green," he says, "who attempts to situate himself in a better position in life by working up the ranks as a telemarketer — which requires that he change himself in crazy ways in order to do it." That change comes shortly after he begins at the telemarketing company, when he gets a helpful tip from Langston, the man sitting next to him — who's played by Danny Glover. "You wanna make some money here, then read your script with a white voice," Langston tells him, as the dubbed voice of a white man (on-set engineer Ryan Coursey) comes out of his mouth. So that's where I started with Stanfield — talking about what it means to change who you are to get ahead. "We all have images that we're attempting to push to other people for better or for worse," he says, "We want people to view us as things that get us through doors, or things that allow us to move through life more comfortably, or things that allow us to make more money or be more successful in the workplace, for example. So we let off an image that we feel is appropriate for whatever we're trying to accomplish. The white voice in this movie, I think, is a metaphor for the different things that we put on to be perceived a certain way." When I first started, I came from an environment where we didn't have very much ... Southern California, near San Bernadino, Victorville, on the way to Vegas you pass through this little desert. And so we didn't really have much stuff, resource-wise, so me moving to L.A. was like me going to the big city, and you would see the lights and the sidewalk that was sparkly, and we thought that was a cool thing — until I got there and realized that it's only cool if you can afford to survive there, which at the time I couldn't ... but just making that transition, going to L.A., for people that lived at home still, they thought that I might be selling out, sacrificing my realness, my rawness, who I really was deep down to come dance in Hollywood. So it was a real conflicting thing for me, making the transition, because I didn't want to disappoint my friends. But at the same time I felt like I was making a change for the better. I mean, after all, the only way you can do something great is if there's great risk. It's my contention that being able to display yourself in any real way — I think that that is a brave thing to do. I have to give all the appropriate kudos to everyone else involved, because they really created an environment for me to feel comfortable displaying my emotions. Really, I did get a little choked up during that scene, because it was personal to me, discussing the journey of parenthood, of the sacrifices and whether or not it's the right way to address a child, is to sort of try to beat greatness into them. Some of these questions I'd had all my life, and so I had to confront them there. And Atlanta will make you confront something that is true to your life, and I really appreciate them for presenting me that challenge. It's my contention that being able to display yourself in any real way — I think that that is a brave thing to do. You know, bravery can be shown by anyone, in any particular gender or whatever people align themselves with. Bravery is simply standing out and saying, well, I'm going to do this and I'm going to feel this and I'm going to be this, regardless. I sat down with myself and said, I have to remain true to myself ... that's my life's journey, that's just my thing that I've been sent here to do. So it's tattooed, in a sense, in my psyche. Mallory Yu, Jolie Myers and Melissa Gray produced and edited this interview for broadcast. Petra Mayer and Patrick Jarenwattananon adapted it for the Web.